Every indicator of global risk is flashing red. And it’s not hard to figure why. 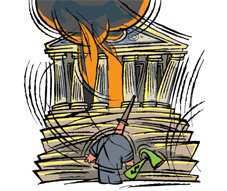 Few took former International Monetary Fund chief economist Kenneth Rogoff seriously when he said exactly one month ago, on 19 August, that the credit crisis would take down at least one large US bank soon. The subsequent reality has been worse. Various indicators show that investors are scared stiff. Money is fleeing to gold, the traditional safe haven, which on Wednesday saw the sharpest one-day rally in 28 years. The Chicago Board Option Exchange’s VIX index, which measures the implied volatility of the S&P 500 index options and is popularly described as a fear gauge, is into the mid-30s — a level that usually indicated panic. The US Fed has been trying to douse the fire for some time now. It lowered its discount window rate, or the rate at which it lends to private banks—to below Libor; and introduced a term auction facility (TAF) on 21 December 2007 for banks to borrow without going to discount window. However, John B. Taylor and John C. Williams show in an April 2008 paper for the National Bureau of Economic Research, “A Black Swan in the Money Market", that none of these measures has helped reduce risk spreads. Not only has the Libor-OIS spread increased since 9 August, it has been seven times more erratic (in terms of standard deviation). In short, institutions are entirely unsure of the creditworthiness of their counter-party. Given all this, lower interest rates is unlikely to help much, as banks may hoard money without substantially increasing effective lending. The Fed seems to have realized this plain fact, which is one reason why it did not reduce interest rates this week despite the market turmoil. More money will only fan the inflation fire. What the global financial market is facing right now is a crisis of risk, rather than one of liquidity.